The inspiration for this project came from the artwork shown here, prepared by my neighbor who is a carpenter. The project was nothing more than a bathroom washbasin mirror with a bunch of lamps around it. 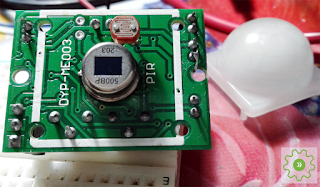 After some experiments with lightbulbs and rocker switches, I decided that it was a dangerous idea to have a rocker switch (made of obscure materials) connected to a fatal AC mains supply very close to my wife when her hands are soaked with water. However, I still cherished it, so to spice things up, I just revamped the concept and added some cool features. First, the enclosure/frame is made of wood and adheres to the rules of standard mirror sizes (thanks to my neighbor). Bulb holders were screwed to the front panel of the frame, with its wires routed through the backplate of the frame. There are also some small wooden pieces to act as spacers between the backplate and the wall — not too bad! 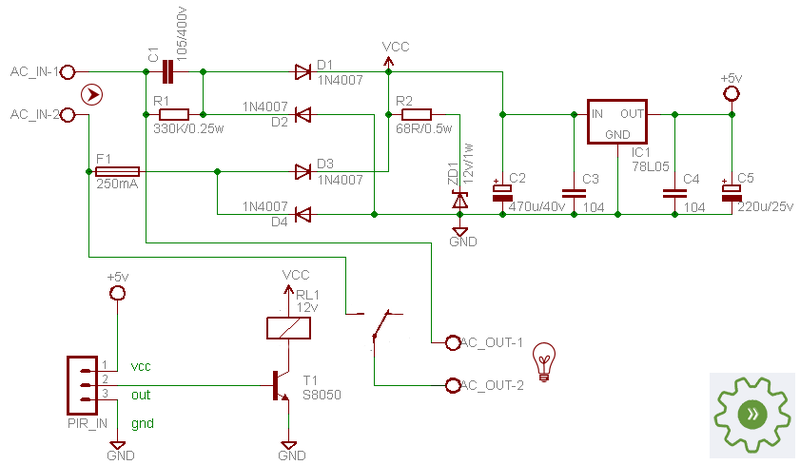 The first part of the schematic is a transformer-less DC power supply for converting the 230-V AC input to about a 16-Vdc output. 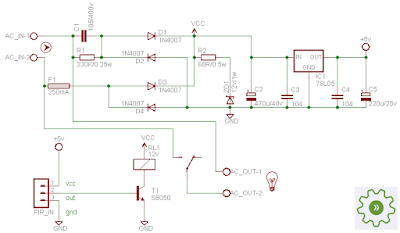 This DC output is used to power the rest of the electronics, excluding the motion sensor. 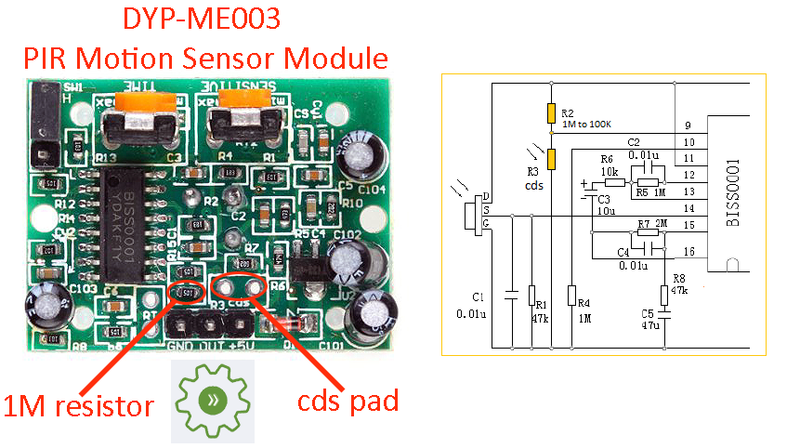 The very popular, yet cheap, DYP-ME003 PIR sensor module is used here for the detection of human motion. Refer to its datasheet for technical specification, calibration information, etc. 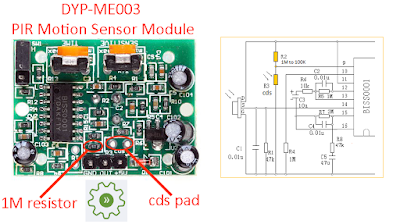 Because the module has a provision to attach one light-sensitive resistor (LDR/photoresistor/CdS cell), a 5-mm standard LDR is attached to the module after a minor mod. This drives the switch to be operational only when the detection area is sufficiently dark (the mirror lights up when one enters the darkened bathroom). For this, just detach the fresnel lens of the module, carefully solder the LDR on the vacant pads denoted as “CdS,” ensuring that it faces toward the fresnel lens, and retain the fresnel lens in front. Next, flip the module to replace the 1M (105) SMD resistor with a 100K (104) SMD resistor. Note that one end of this resistor (and one lead of the photoresistor) is linked to “trigger disable” (pin 9) of the BISS0001 IC. The other end of the resistor is tied to the 3.3-V (Vcc) rail, whereas the second lead of the photoresistor is connected with the 0-V (GND) rail. The PIR motion detector might be tricky to implement. The light coming from the LED lightbulbs may mess with the ambient light sensor inside the motion detector module, and this may cause erroneous operation when the mirror is alive. So it is necessary to isolate the module from the light source. Not a big deal!